Radiant heating, also known as 'infrared heating' is entirely different from heating by conduction or convection heating. Heating by conduction is where a warm object is in direct contact with your body - for example, a hot-water bottle. Heating by convection is where warmth is transferred to you through another medium - usually the air. This is how a fan heater or central heating radiator works. In some circumstances, this can be very wasteful - for example, if a building is large or poorly insulated - since it is necessary to warm the whole volume of air in the building before you feel warm. So, how does radiant heating work? Imagine being outside on a sunny winters day. You can feel the warmth of the sun on your body, but if you step into the shade, you instantly realise how cold the air is. This is because the sun heats the earth with radiant heat. No particles are involved in the transmission of infrared, which is why we can still feel the heat of the Sun, even though it is 150,000,000km away from the Earth. 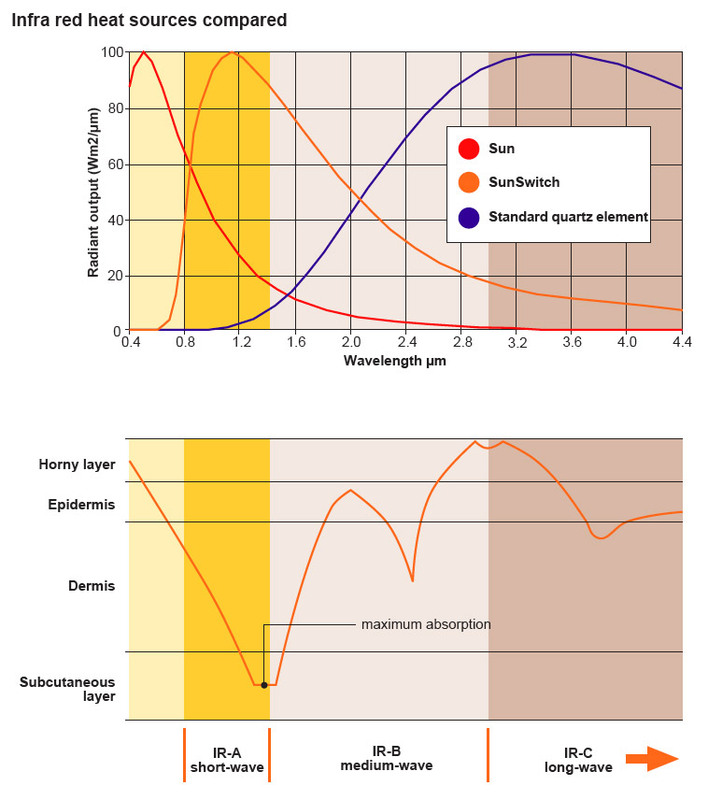 Logically, humans and other vertebrates are physiologically adapted to receiving infrared warmth from the sun. Let's drill down a bit further. The Sun warms the earth using shortwave infrared (more on this below). Longer wavelengths of infrared are filtered out by the earth's atmosphere. Happily, nearly all of the radiant energy produced by SunSwitch heaters is in the shortwave region and closely resembles that of the sun. How good is that! It is notable that quartz halogen infrared heaters (the type of radiant heaters we exclusively supply) work more or less instantly, that their heat output is not sensitive to air movement, and their output can be focused effectively with reflectors. This makes them suitable for use in places where other types of heaters would not work effectively, including areas that may need to be partially or completely open to the elements. Furthermore, because the heating principle is radiation, the ‘throw’ of warmth from quartz halogen heaters is greater than heaters operating in the IR-B and IR-C bands. Comparing different IR frequencies with the effectiveness of cutaneous absorption is very interesting (lower chart above). The SunSwitch emitter peaks very close to where infrared absorption into skin tissue is greatest. This highlights why quartz halogen infrared is such an effective heat source for warming humans, equids and other vertebrates, compared with other infrared heating technologies. Par38 and R95 infrared bulbs have been available for some years for human healthcare and animal husbandry applications, typically rated at 100W or 150W. 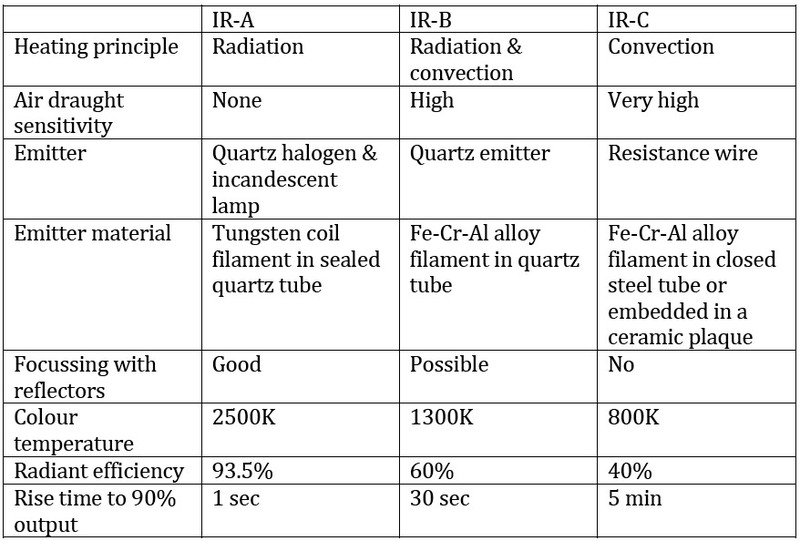 The better ones provide the same quality of IR-A heat output as a quartz halogen tube, but they have two disadvantages. The first is that the throw of heat is very limited so they need to be mounted in close proximity to the subject (typically 450mm). The other is that lamp life is usually quite short at around 300 hours. (a good quality quartz halogen tube will last for 5000-7000 hours without control, and 35,000 + hours with control, depending on usage. The intensity of heat received from a quartz halogen heater source obeys the inverse square law, which means that the heat energy available decreases disproportionately as a square of the distance from heater to subject. This has a critical bearing on determining the optimal mounting heights and power ratings of infrared heaters for all applications. IR-A passes readily through glass when mounted at a high angle of incidence, just as infrared from the sun will pass through a window to warm a room. This may provide some useful alternative design possibilities for warming enclosures or rooms, though the glass must be able to withstand the temperature gradient produced by the heater/s. Some quartz halogen heaters are supplied with tempered glass fronts to maintain a high IP protection against dust and liquids, though many modern designs have protective grilles in place of glass and still have an ingress protection rating of IP65 or higher. Shortwave infrared can be readily bounced off reflectors. Some of the infrared heaters available have optically-designed reflectors that help to project and focus the warmth. Separate baffles can also be used to diffuse or direct the radiation. Returning to the basics discussed above, most of the heat from a quartz halogen heater is in the IR-A region. Anything within the ‘radiation zone’ in front of the heater will absorb the infrared and becomes warmer. Broadly speaking, anything outside this zone will be unaffected.